Idiot UK Drivers Exposed came to us with a Facebook page that had been a little more successful than they’d expected. When Daniel started the page in his bedroom in early 2014 he had no idea how popular it would prove to be and, once the page hit over 240,000 likes and a reach of 2 million people per week it made sense to break away from the limitations of their original platform and set up a website so that Idiot UK Drivers could be used to advertise and, with any luck, become even more successful. Daniel and his dad, Dennis, own a haulage company and the Idiot UK Drivers story began with the reckless and, yes, idiotic driving that they themselves would witness whilst out and about the country in their lorries. What was a small Facebook page Daniel used to vent about his own experiences grew to include contributed videos and in just a few short months had exceeded everyone’s expectations, sharing footage sent in from around the UK. 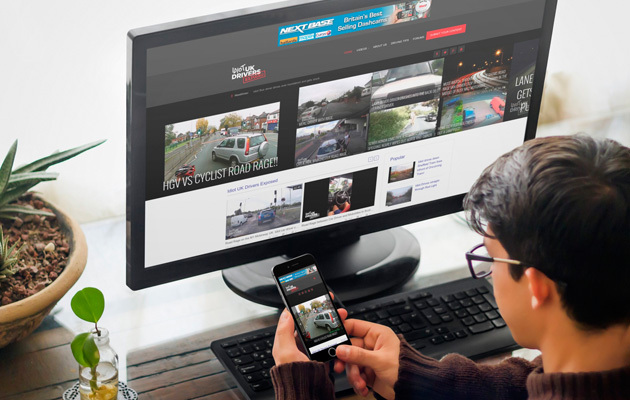 Idiot UK Drivers Exposed has now reached out to over 40 million people and their current average audience is around 10 million a month, and growing. The new site needed to allow Daniel and Dennis to grow the brand without boundaries, and the restrictions of Facebook, whilst also allowing to them to take control of their own advertising. He wanted to create a bit more of a brand identity too, something that could then be spread across all of their social platforms. Having the site design helped them identify a colour scheme and it became the link that holds the Facebook, YouTube, Twitter and Instagram pages together. It has also given Daniel the freedom to partner with companies such as Nextbase and set up a forum, run competitions and reach out to more of his followers than ever before. We wish Daniel the best of luck with his newly launched site and hope to see Idiot UK Drivers Exposed go from strength to strength. Whether you’ve accidentally created a bit of a viral storm on social media, or you just fancy a new site anyway, get in touch. We’d be happy to hear from you.